Forgive the large amount of photographs of this lighthouse but it was a great thrill to finally meet it and say hello and I was somewhat star-struck! As previously mentioned, a light was first placed on the highest point of Inis Mor on 1st June 1818, with the intention of lighting the whole Aran Island group. It quickly became obvious that the results achieved were not good enough and it was replaced in 1857 by Eeragh and Inis Oirr, when the light was put out to grass. A report into the harbours and shores of the British Isles in 1845, states that "The light at Arran is perched too high; it is 413 feet above the level of the sea. Captains of vessels often see the rocks before the light. 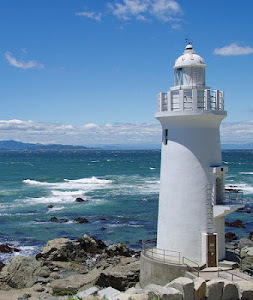 The lighthouse is painted white and the light is a revolving one." An 1831 description of the light by Alan Stevenson says that "this light revolves and is seen at the distance of five or six leagues, or at lesser distances in hazy weather, The light appears once in every three minutes in its brightest state, like a star of the first magnitude, and, gradually becoming less luminous, is eclipsed." Well, the light is no longer painted white - not a trace of paint remains. Approaching it, a large sign says that Dun Arann is closed for renovations but there was no sign of any renovation work going on when I was there. There are large holes in the wall where you simply walk into the compound. Considering it has been abandoned for 160 years, the tower itself looks in a great structural state. The lantern of course has been removed and the surrounding buildings are in various stages of demolition but the tower looks great. The door has been replaced by a piece of metal and iron railings. Peering inside one of the windows, the inside staircase appears intact. How to get there? Well, if you don't feel like biking it out to Eeragh, take the road uphill from The Bar in the centre of the village of Kilronan and just keep walking. Its about a mile and a half. Watch out for the little lane leading up to the left. I approached it after visiting Eeragh by bike. Returnig downhill to Kilmurvey Beach, don't take the coast road back but the next one. Its a long climb but not particularly steep. Obviously the lane is on your right this time. You should be able to see the light from the road, as there are several lanes. I wheeled my bike up and there is a little area just below the light to leave it. I must admit that freewheeling all the way from the light down into Kilronan again was absolutely exhilerating and made me feel like a seven year old again!!! Okay, so you've arrived on the largest of the Aran Islands on the eastern side of the island. The vantage point from which you might be able to view Eeragh Lighthouse is 12 kms away on the western side of the island. It is unclear if the roads are navigable on the western side of the island. What's the best way? Well, you could walk, I suppose. I considered it. I reckoned I could do 24kms easily in four hours, there and back and be back in time for the ferry. Or maybe take one of the myriad minibuses that meet you at the pier. But if you can only go so far and then walk, would they wait? Ditto the pony and traps that tout for business. But I opted for a bike. I had only biked once in the past forty years and that turned into a disaster. But this route followed a coastal path, so was less likely to be undulatory. So €10 for a bike for the day from the shop at the end of the pier, a few cursory directions and off I went. Basically, from the shop, you don't turn right to follow the road around the coast but turn left to go to the centre of Kilronan. At the imaginatively-titled pub "The Bar" turn right and go uphill till you come to Watty's Bar and then turn right. This brings you onto the road you want - simply keep the coast on your right, all the way. After Kilmurvey Beach, the road rises steadily. It is a long hill and was the only part I had to get off and walk and me 57 years old and unused to cycling. 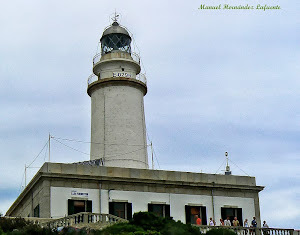 Shortly after reaching the top of the hill, on the downward leg, the lighthouse hoves into view on the right hand side, saving you the bother of a full ascent on the way back. It appears that the lighthouse is on the second (further) island out and presumably only accessible by boat or helicopter. It is either painted white with three black stripes or black with three white stripes, although the bottom stripe is more grey than black. There is a large solar panel visible on the other side of the keepers' house, which looks like a dormer bungalow with windows in the attic. Built in 1857, it is 31 metres tall. It was automated in June 1978. Travelling over to Inis Mor on the ferry from Rossaveal, the next light you come across - apart from a very brief glimpse of Eeragh beyond the northern point of the island - is the lighthouse on Straw Island. As my wife would say, this is a real lighthouse and is remotely operated from CIL HQ in Dun Laoghaire. Built in 1878, the lighthouse here sits on a very low-lying rock of land on the approach to Kilronan, the largest settlement and landing berth of Inis Mor, the largest of the Aran Islands. So low-lying is this island, that it is believed that the light is in danger of being washed away. In 2014, it was extensively damaged by a storm. The Aran Islands consist chiefly of three islands running in a string from northwest to southeast across the mouth of Galway Bay. Inis Mor is the largest, then Inis Maan and then, closest to the Clare coast, Inis Oirr. In 1818, a light was erected on the highest point of Inis Mor and this was deemed sufficient to safeguard marine activity in the vicinity. However, as with several other lighthouses around the country - Wicklow Head and Cape Clear, for example - it was soon evident that the light was built at too high an elevation and was frequently shrouded in mist and cloud. Therefore, they decided to build one light at the top of the chain of islands (Eeragh) and one at the bottom (Inis Oirr) and this was done in 1857, when the original light was dicontinued. However, the islanders soon came to realise that neither Eeragh nor Inis Oirr was in fact visible from Killeany Bay, the natural harbour that protects Kilronan, the main port on the islands. So they petitioned for a harbour light. And, with their usual speed and efficiency (in the nineteenth century), a light was eventually established on Straw Island in 1878. It appears from the map that it should be possible to view the lighthouse at close range from land by taking the coast road past the airport and then striking out to the left when this road turns right. However, it does not seem to get you any nearer than the ferry, which passes very close, though of course, a steadier hand than mine would have got better pictures! Photographs 1-5 on this page are taking on the approach to Inis Mor. Photographs 6-7 are taken leaving Inis Mor. Photographs 8-10 are taken from the old lighthouse in the centre of Inis Mor. Further out, on the western side of the entrance to Cahla Bay is this squat, unattractive concrete box painted white. It looks as though it should be possible to reach this light by road by driving round the bay and heading south west when you hit Carraroe. Not that its worth the effort, of course. The light is powered by a solar panel, just visible in the top picture. Trabas lists its location as Killeen. 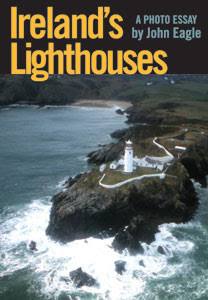 I was very saddened to learn, shortly before Christmas, of the death of John Eagle, author of two photo essays on Irish lighthouses. John was an Englishman whose connections with West Cork dated back to the sixties. He lived in Eyeries on the beautiful Beara peninsula and was often found in the tourist office in Castletownbere. 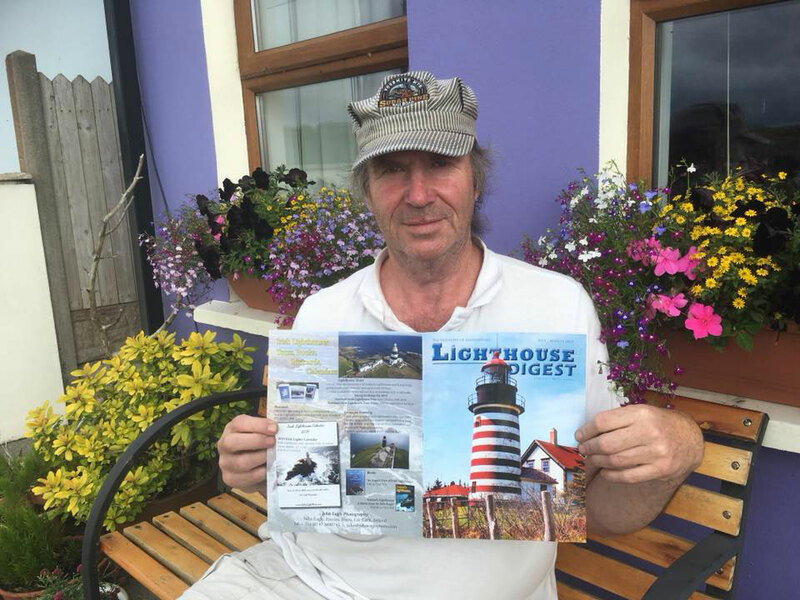 A long-time lighthouse enthusiast, he made it his mission to photograph every Irish lighthouse, or at least those under the control of the Commissioner of Irish Lights. He produced postcards of the lights and also two photo books. I have to say I was extremely envious when he applied to CIL to cadge rides on helicopters bringing technicians to the remoter lights. The resulting photographs were absolutely stupendous. Latterly, he acquired a drone which gave him another angle to his lighthouse photography. 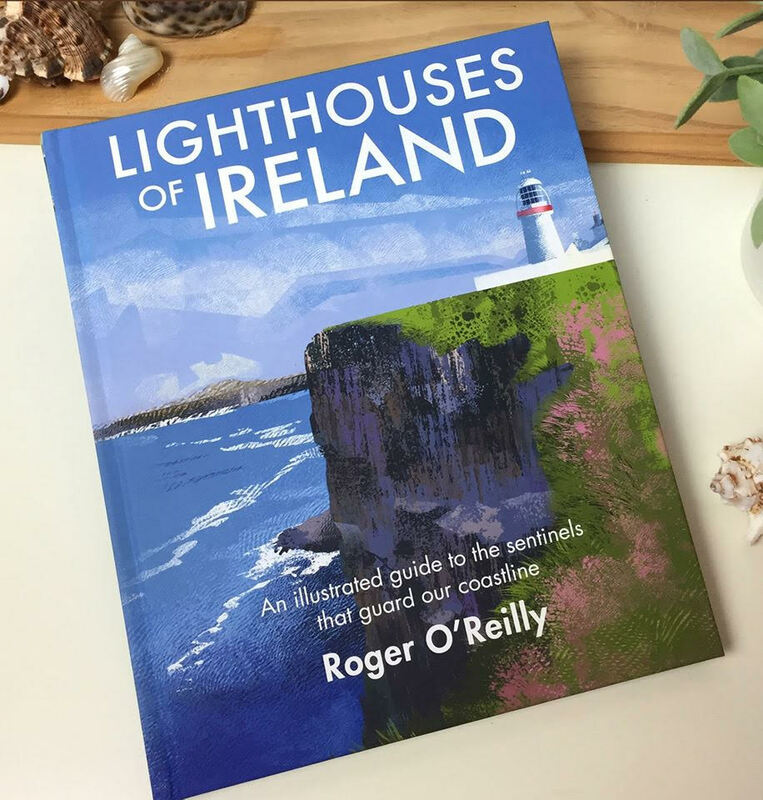 In addition to this, he ran annual lighthouse tours around Ireland - normally a southern tour and a northern tour, which were very well received. Apart from his love of lighthouses, he was also a very accomplished artist, painting landscapes of his beloved West Cork. I never met the man but conversed with him by email on occasion, when some change to the lighthouse infrastructure happened. Through his contacts in CIL, he was always able to answer my queries. His website is still up, full of photographs. I have no idea what is going to happen to it.